So I shared the above photo from Inkology today on my Facebook. The last I checked the abov picture had got 24,000 shares! Which means it has struck a deep chord with most people. When we spend time with people we love, there are chemical changes that happen in the brain. Our bodies release Oxytocin --feel-good-hormone. When we are in love too, our bodies release vast amounts of oxytocin. From a purely Darwinian point of view, this occurrence has evolved over the years as we need to bond for the survival of the species. I have just had my one hour dose of oxytocin just now. 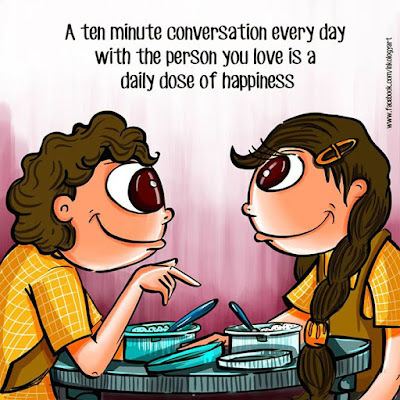 Had a long long conversation with someone I totally love. And I am going to be seeing him tomorrow after two whole weeks of missing him. No--am not going to tell you who he is. But he is someone special. Hope you got your daily dose of happiness today. If you didn't just call up that person you love. Forget 'whose turn' it is to call. Have a nice conversation with them. Call up your parents. Call up your grand-parents if you are fortunate enough to have them. Go spread some oxytocin around. amazing! sometimes we need not do anything. happiness comes uninvited, taking away every ounce of gloom. You are awesome Preeti!! Life is all about accepting differences and let go off the old frays, petty fights, cold wars and grudges. As rightly said "Pain is inevitable but suffering is optional", we must learn to embrace the difference and accept the people and their individuality. Of late in this dogmatic world, people often forget the basic fundas of life and you promptly remind people of how important relationships are. Your family and friends must be loving you so much and feeling blessed. Love you! It's amazing Preeti. On Wednesday, a friend called me for my birthday from Pune and we spoke lot about career, life and it was a quality conversation. It just pep up life, more meaningful than FB likes or comments. Somehow, we need to get out of our FB mould and be real. Ten minutes can seem like ten hours whenever we speak to someone who we haven't in a very very long time. But after hanging up, we feel so special that we made time and called that one special person who really makes our life worthwhile. The image is too cute. Thanks for posting!